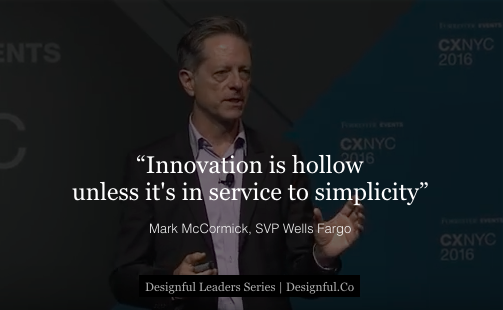 As the first issue of #Designful.Leaders series, I had a great conversation with Mark McCormick, a Senior Vice President at Wells Fargo and Head of User Experience for the Wholesale Bank, on simplicity and innovation. Mark and I met about three years ago, in China at a conference, where he presented his customer experience innovation journey at Wells Fargo, and I presented ‘Simplicity Is The New Black’ – the idea that simplicity is the value that never goes our of fashion, and which the financial services organization should pursue relentlessly. Since then, we have exchanged ideas on and off through emails but we didn’t get to meet again, given the geographic distance. Recently, we have finally carved out some time that worked for the US and Singapore time zones to share learnings from our simplicity journey in the respective organizations. The part I enjoyed most was the relation between innovation and simplicity, and his sharp definition on the role of simplicity in innovation. Our conversation became more interesting; we both had to agree that applying simplicity in our private lives is way harder than practicing simplicity in the business context! Here is the highlight of the conversation. 1. Mark, how did your simplicity journey start? [Mark] You started it! I credit you completely. Your presentation at Next Bank China in 2013 really provided the basis for my work in this area. You should be very proud of the influence you have had on banking worldwide! Mark at Forrester’s CXNYC 2016 discusses the power of simplicity in the customer experience. 2. Why does simplicity matter? [Mark] We’re living in The Age of the Customer in which empowered consumers vocalize and broadcast their feelings about a brand. I believe that simplicity will largely define customer expectations in this era. The Index tracks the financial performance of a portfolio of companies that rank high on simplicity criteria. In 2016 a portfolio of the world’s simplest brands had beaten the average global stock index by 331% since 2009. Businesses that want to succeed should be thinking about simplicity. 3. How does simplicity relate to trends like customer choice, delight, and innovation? Delight. CEB, Inc.’s research debunks the belief that wowing customers increases loyalty by showing almost no difference to loyalty in meeting versus exceeding customer expectations. Innovation. Effortlessness makes customers more likely to stay with a brand. Innovation must serve simplicity. 4. How should businesses approach adopting this new cultural mindset? [Mark] It starts with a shared belief that there is a case for change based on compelling data. It also involves personal self-reflection to validate that the simplest experiences are the best ones. Cultural change must be bottom up and top down. Those who shape customer experiences, such as designers and product managers, must view simplicity as a worthwhile pursuit. Senior management must set the vision and champion the cause. In making the business case it’s critical to link the level of complexity for the customer to the level of exertion internally. Let’s say that your customer service representatives juggle internal systems and processes to respond to customers. How can they convey confidence or other brand values if their own experience does not reflect these values? 5. How can companies begin to develop simplicity as a framework? Commit to the essentials.Determine the most essential elements of your business, commit to them, and eliminate what is non-essential. The next step is to map key journeys to find the pain points to address in order to make the essential journeys flawless.Create a human story. Develop a narrative that is verbal and visual, logical and emotional. People tend to perceive a story that contains all of these elements as simpler and persuasive. Test and measure. Establish a simplicity metric to assess what you’ve created. Choose a proxy that best indicates simplicity. This might be, for example, the number of clicks to complete a task or the number of times that customers describe a task as complicated. 6. What practical advice can you share to help companies to embrace simplicity? [Mark] Adopting a new mindset requires selling an idea. It’s important to reach as many people as possible with the simplicity message. It also helps to connect simplicity with existing enterprise-wide initiatives. For example, can you demonstrate that by reducing the number of products offered you can involve fewer back office systems in addition to giving clients a more elegant experience? When you can demonstrate that less effort drives objectives such as efficiency and effectiveness then executives will take notice. 7. What was the biggest challenge in embedding simplicity in your organization? [Mark] The biggest challenges include changing lost-established ways of working and thinking. We tend to involve a lot of stakeholders on our teams, which means that “everyone has a voice.” When that happens, complexity can result. But it’s hard to streamline our decision-making process, because then people will feel left out. In addition, we have had great success reaching individual contributors and managers, but executive-level, C-Suite supporters have been harder to reach. I believe that any great cultural change—and that’s what this is—needs to be both bottom-up and top-down. The entire program was built from the bottom up with people from all over the bank, and we’re working on the top-down part of the equation. We have some great meetings lined up. It won’t be a hard sell, because our Vision and Values handbook mentions simplicity many times. What we want, though, is for a strong voice from above to say that simplicity is core to our overall business strategy. Then things will start to change. 8. I am very intrigued by the relation between simplicity and innovation. Could you share some examples that illustrate the concept? When I talk about innovation and simplicity I say that “Innovation is hollow unless it’s in service to simplicity—to making our customers’ lives, and our own working lives, more simple. I believe that when you focus on making something simpler then innovation is the result, but it’s not the other way around. For example, in financial services, the greatest disruptors, the greatest innovators, are those organizations that have focused on simplifying a key banking task—like getting a mortgage, or refinancing a student loan, or doing a quick transfer of money from person to person. They talk about “innovation” but they really mean “simplification.” I challenge your readers to start noticing this. When they see a new product or service that is billed as innovative—see if the real value proposition is simplification. It’s true of Uber, for example: getting from point A to point B is suddenly simpler. And yet we think of Uber as an “innovator;” let’s start calling these kinds of companies “simplifiers.” Many studies have shown that getting a task done simply is far more important to people than getting a task done in a new and novel way. 9. How do you find simplicity in your life? [Mark] We have a strategy in our simplicity framework called “commit to the essentials.” I try to think about what’s essential in my life, and I commit to those things. Maintaining good health, for me, is essential. I study yoga—all aspects including physical, mental / psychological, academic, and spiritual–and that keeps me in good physical and mental health, I believe. Also, it helps me focus on that which is most essential in all other aspects of my life: from work to family to recreation. What do I really want? How do I want to spend my time? With whom? How can I be of service? I try to commit to the essentials, and yoga helps. But I should say I’m far from successful in many simplicity arenas! I’ve had the bestselling book The Magic Art of Tidying Up on my table at home for over a year. I sometimes look at it then slam it shut: she’s right! I do need to go through every book and every sweater and figure out which ones are most “essential.” But narrowing down my personal possessions has been the hardest thing for me, from a simplicity perspective. I know you can relate, Jin: we both love shoes, right? It’s hard to get rid of them! Global Brand Simplicity Index, 2017.